I have permission from the "Belleville Times" newspaper to copy word for word on my web page. The article you are about to read is from May 25, 2006. It is on the front page and on page 3. The story was written by David Hinrichs and photo was taken by John Montalvo. Edited a bit that was missed to print in the paper. Like the biggest pledgers and Mike record amount been changed and word "THE" in Coast the Coast. Local resident Michael Dowd continued his streak of over 15 years this past weekend by participating in the Multiple Sclerosis (MS) Mid-Jersey Chapter "Coast the Coast" bike tour to raise funding for MS research. Dowd has ridden in at least one MS bike tour since 1990. 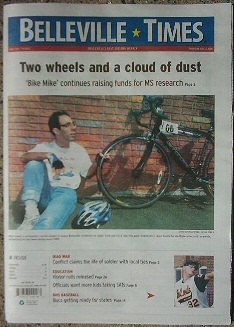 Known by many as "Big Mike" for having a big heart or "Bike Mike" for spending so much time on his beloved bike, Dowd has made it priority to raise funding for MS research year in and year out. "I started participating in the tours in 1990 when I saw a small article about the MS 100 tour in the paper,"said Dowd. "I signed up for the challenge of the bike rides initially but as I learned more and more about MS I started doing it for the cause." Dowd's most recent tour, Coast the Coast tour, spanned 170 miles starting at Monmouth University and ending at the US Coast Guard Station in Cape May, running from May 20 to 21. Dowd biked for over seven hours on Saturday and nine hours on Sunday, ending his voyage at approximately 4:25 pm Sunday afternoon. "There was a lot of headwind this year which really makes the riding difficult. That kind of wind gives riders resistance and can make the trip much longer than usual,"said Dowd. "These tours are not races, though, so everyone pedals at their own pace. The whole thing is just about raising money for research." Dowd is no stranger to biking long distances as he uses his bike for traveling everywhere he goes, being prohibited from driving in the state of New Jersey due to his limited vision in one eye. Dowd is also deaf in one ear but does not allow these conditions to hinder his bike riding as he rides anywhere from 15 to 40 miles a day during his training sessions that he conducts during the warm weather months. Dowd uses his ridng commitment to raise money for MS, raising $2,734.00 this year, eclipsing his record high for funds raised of #2,390.00 he set back in 2000. "I never thought I would raise more money than I did in 2000 but I was able to surpass that number this year," said Dowd. "I would like to thank all those who pledged for me this year. Without those pledges I would not be able to participate in these tours. Dowd received his biggest pledge this year from Mirco Stratigies ($500), World Wide Gear ($250) and Applegate Farm ($200). Dowd also received pledges from the Belleville Elks, Knights of Columbus and a close friend from CNBC who pledged $135.00 for Dowd. Although Dowd appreciates all the support he receieves from his friends and pledges, he knows that the biggest supporter he has is his mother, to whom he artributes most of his success. "The biggest supporter I have in my life is my mother. Without her, none of this could ever happen,"said Dowd. "She is the one who drives me to my tours and has encouraged me from the beginning. She told me she gets tired just watching me ride." A 2002 Olympic torchbearer, Dowd plans to continue his active lifestyle by continuing to ride in upcoming MS tours for years to come, including this September's Greater North Jersey MS 100 tour in Morristown to be held Sept. 16 and 17. "I like to race in two tours a year now and will continue to do so far as long as I can,"said Dowd. "I have been a bike rider all my life and it is what I do."